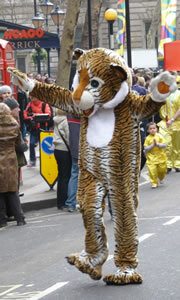 The public celebrations in London were on the afternoon of Sunday 29 January 2012. 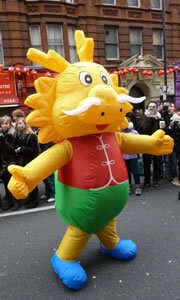 There are also public events in other UK cities with a Chinatown area, such as in Manchester, Liverpool, Birmingham and Newcastle. 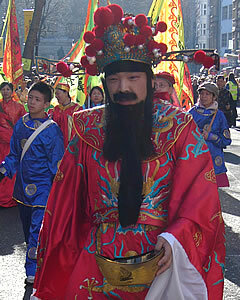 The main public celebrations in London in Trafalgar Square and Chinatown are usually on the first Sunday after the start of the Chinese New Year. 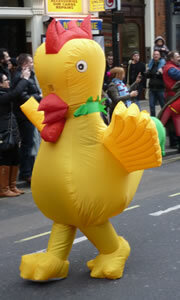 In most years the event starts with a grand procession through the streets. 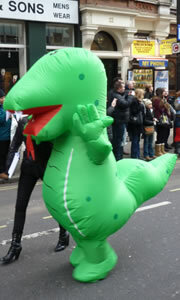 This usually starts near Trafalgar Square and goes up Charing Cross Road and back down Shaftesbury Avenue before returning to Trafalgar Square. 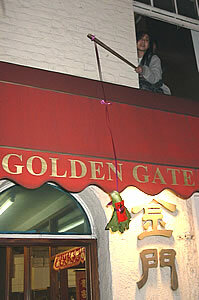 It is traditional that the money god (the middle picture below) hands out red envelopes containing money or vouchers. 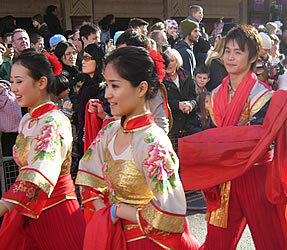 Red is a symbol of good luck and prosperity, so this colour is popular during the Chinese New Year celebrations. 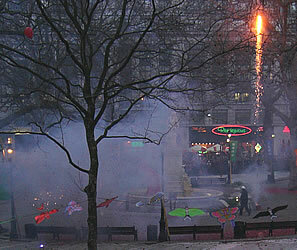 At 12 noon firecrackers are set off in the middle of Trafalgar Square (these are loud, so you should protect your ears). 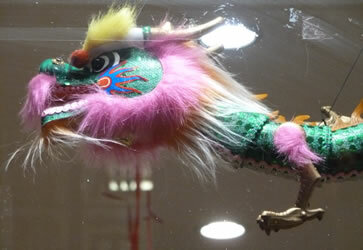 These are said to wake the new year's dragon from its sleep, and to scare away evil spirits. 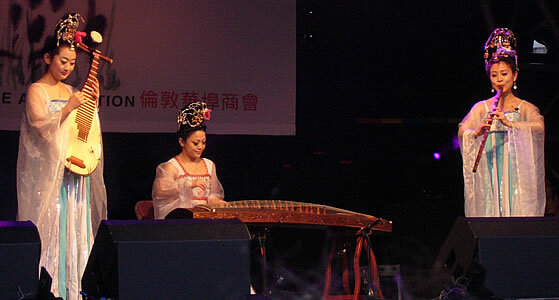 This is followed by a formal ceremony at which British and Chinese officials give short speeches connected with the relationship between Britain and China. 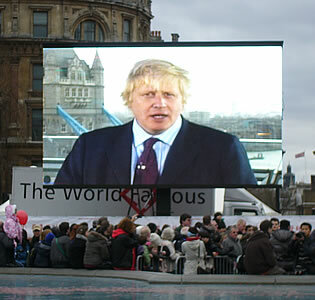 The Mayor of London usually attends or sends a recorded message. 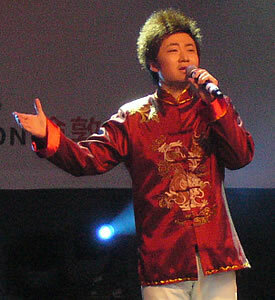 Each speaker usually finishes by wishing the crowd a "Happy Chinese New Year!" 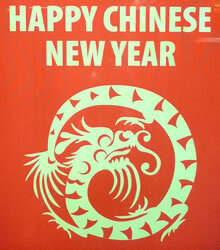 In Mandarin it is Xin Nian Kuai Le. 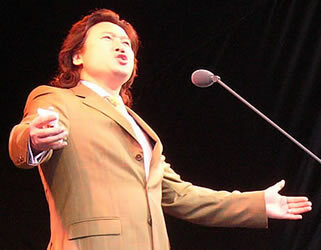 Hear how this is pronounced here: http://goodcharacters.com/mp3/happynewyearmp3.swf. Xin means "new", "Nian" means "year" and "Kuai Le" means "happy". 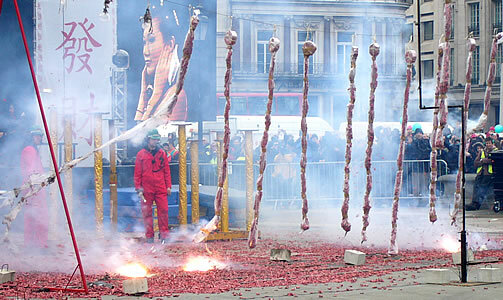 Before the lion dance, officials take part in a dotting of the eyes ceremony (known in Chinese as the Hoi Gong ceremony). 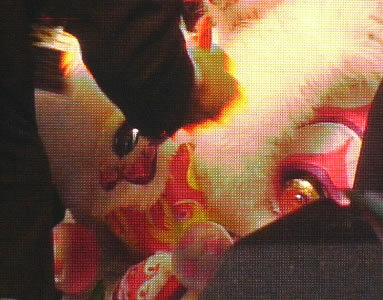 They use a calligraphy brush to paint red ink on a new lion's costume. The lion starts off with its eyes and mouth firmly closed. First the mirror on lion's forehead is dotted to awaken its spirit and give it life. Next the eyes are dotted to give the lion sight, and this is followed by dots on the nose, tongue, ears, horn, back of head, spine and the tail. 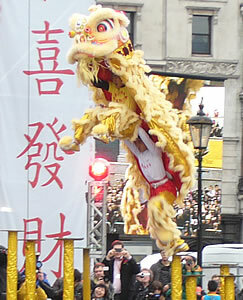 A red ribbon is tied on the top of the lion's head. This is a symbol of courage and honour and shows that the lion is tamed. It is also a reminder to the lion to do only good deeds. 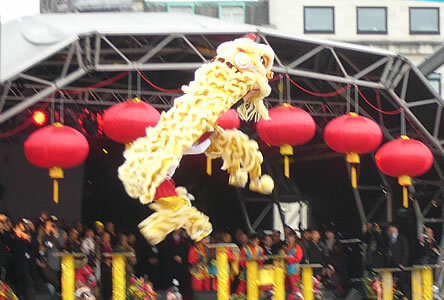 Once the lion is fully awake it performs a lion dance. 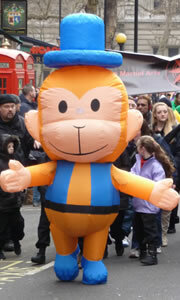 If this is done well it is believed to scare off evil spirits and bring good fortune, happiness and prosperity. 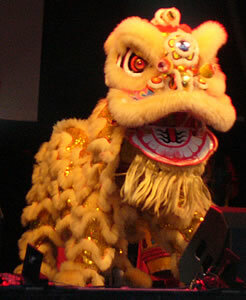 Lions have never existed in China, and the costumes used in the dances are not very similar to real lions (for example, these ones have a horn on the top of the head, and a beard). 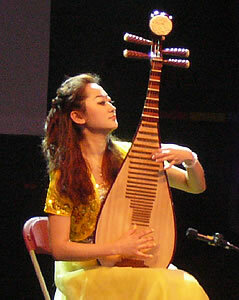 In traditional Chinese culture they are seen as peaceful creatures which are divine animals of nobility and dignity. They symbolise strength, courage and wisdom. 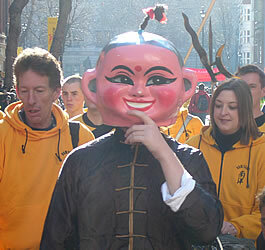 This is followed by a dragon dance. 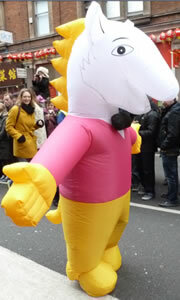 In Chinese mythology dragons are associated with good luck, long life and wisdom. 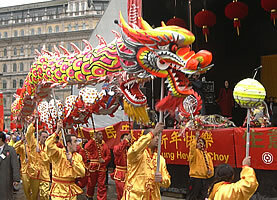 During the dance the performers hold poles and raise and lower the dragon. 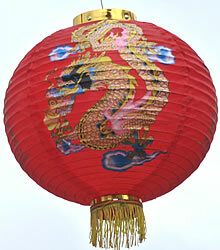 One person carries a 'Pearl of Wisdom' on a pole and he entices the Dragon to follow him to the beat of a drum, as if searching for wisdom and knowledge. 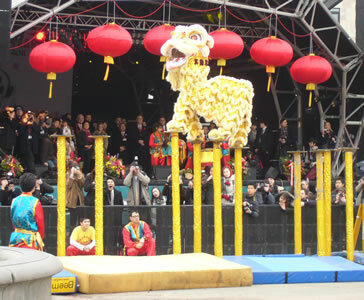 After the lion and dragon dances, the barriers around the centre of Trafalgar Square are removed and the crowd is allowed closer to the stage to watch the other performances. 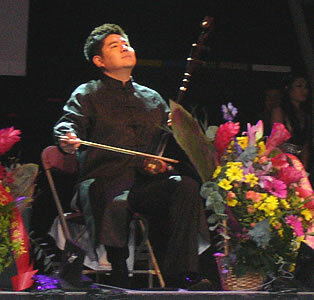 Each year members of one or two cultural groups (from one of China's regions) are invited to come to London to perform on stage. 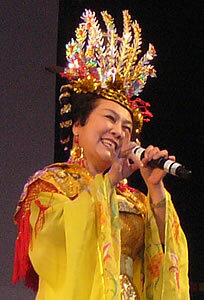 These troupes include singers, with a wide range of styles ranging from folk to opera. 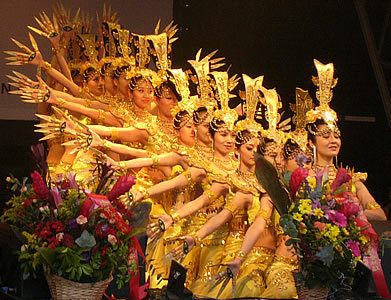 Classical Chinese dance dates back over 5,000 years, when dancers performed at the Royal Court of the ancient dynasties. 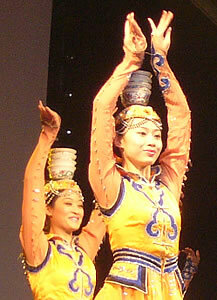 Dances were often inspired by folk stories and myths, by moral themes, or by the natural or divine world. Originally dances were passed down through communities, but over the past 100 years classical dance has been documented and taught formally. 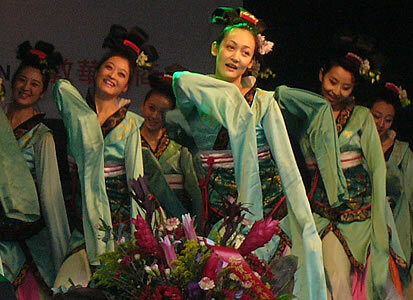 Some folk dances have incorporated elements of folk operas and techniques from ballet training and Chinese martial art forms. 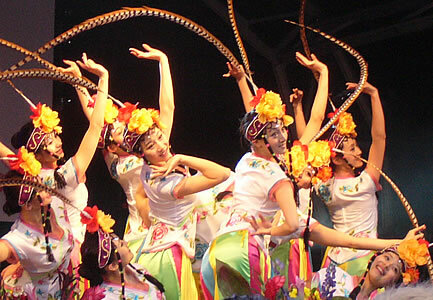 The regional dance troupes each have their own unique styles and colourful costumes. 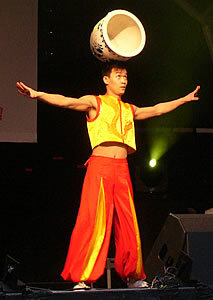 Chinese acrobatics is one of the oldest performing arts, dating back more than 2,000 years. 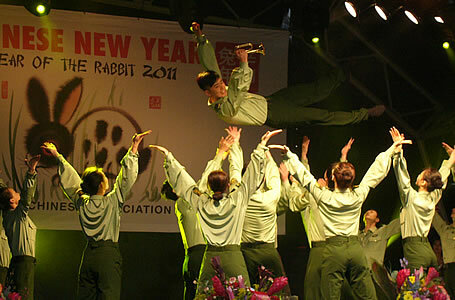 Typical acrobatic performances include lion dances, balancing acts (sometimes on cycles, tight-ropes or stilts), hoop diving, gymnastic leaps and somersaults, juggling and pole-climbing. 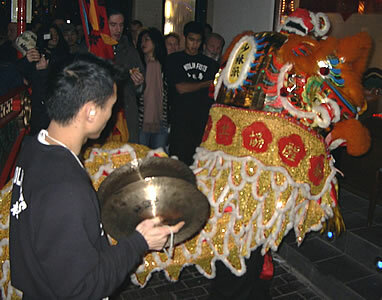 Through the day and into the evening, lions visit each of the Chinese restaurants in the area, to the sound of drums and cymbals. 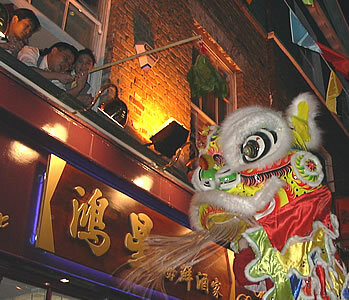 The lion is given a cabbage or similar vegetable to eat. 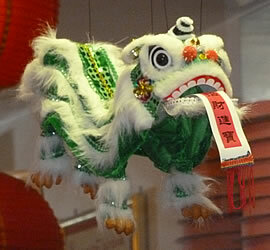 The lion's visit brings good luck and prosperity to the shop over the following year. The tables below shows the first day of each Chinese New Year since 1900. To find out your Chinese Zodiac sign, find the year in which you are born in these tables. If you were born in January or February check if your birthday is before the date shown - if it is, you were born in the previous Chinese New Year. 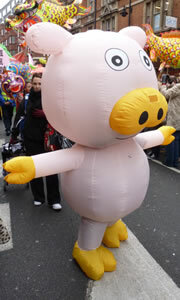 The animal which represents each year is shown in the left-hand column. Some of the believed characteristics of people born in each animal's year are shown below. Born leaders who will work hard to achieve their aims. 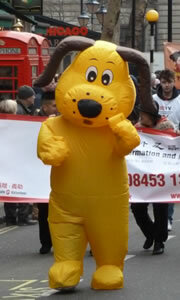 Dependable, good organisers and not easily influenced by others. Patient, loyal to their friends and expect loyalty in return. Sensitive, emotional and adventurous. Confident, risk takers and dislike taking orders. Good at seeing problems, but less able to see the solutions. Warm and generous to the people they love. Affectionate, gentle with strong family ties. Caring and hates conflict. Peace-makers with lots of friends. Dislike being the centre of attention and enjoy the good things of life. The luckiest of the animals. Confident, hardworking and always strive to be top. Full of energy, determined and inspire other people. Dont like routine. Popular and fun-loving. Charming and good thinkers. Love the finer things in life, so only the best is good enough. Good at making and saving money. Prefer not to rely on other people. Very hardworking and independent. Will work on and on until a job is finished. Very intelligent, ambitious and expect to succeed. Can cope with several projects at once. Easily fall in love. Elegant, artistic and good-natured. Inclined to worry too much. Peace-lovers who prefer to avoid disagreements. Family is very important. Hardworking, strong-willed and confident. Well organised and good time keepers. 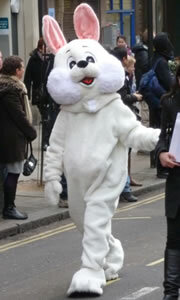 Enjoy being the centre of attention and love flattery. Can be outspoken and may criticise other people. Faithful, honest and ready to serve others. Believe in truth and justice. Willing to listen to peoples problems. Do not easily forgive those who cross them. Tend to worry too much. Honest, peace-loving and make good friends. Will try not to argue and rarely lose their temper. Love the good things in life and are very willing to share with others. Can be untidy at home. 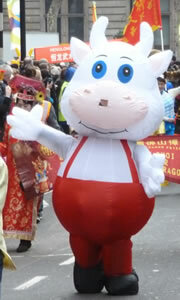 There is a folk story that describes how the animals were assigned to the cycle of 12 years in the Chinese Zodiac. 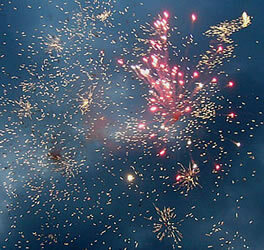 Many hears ago, the Lord Buddha summoned all the animals together to assign a year to each of them. When the cat heard the news, he told his friend the rat and they decided to go together the next day. However, the following morning the rat did not wake the cat and left him sleeping. 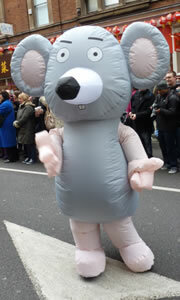 The cat was late, which is why there is no year of the cat, and why cats now hate rats. The rat knew that a small animal like him would not be able to travel as fast as the other animals, so he begged the ox to let him ride on its head. The ox agreed and they went together. Just when they were about to arrive, the rat jumped off the ox's head and arrived first. 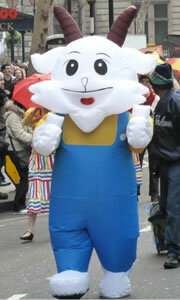 This is why the year of the rat is the first year in the cycle and the year of the ox is the second.